The new CG animated film Harlock: Space Pirate was released on DVD today and I was lucky enough to have gotten a review copy so I've gotten to see it twice already. First I watched it with the original Japanese language track and then I watched it again with the English dubbed language track. My preference is definitely the Japanese audio as I didn't think some of the English voices fit quite right. Though that may have just been because I had gotten accustomed to the Japanese voices for the characters. It's hard to say. Visually this movie is stunning! It's mostly very dark, but that works well for a movie about space pirates. Captain Harlock's ship, the Arcadia, looks brilliant in 3D. It's been a long time since I've seen the original Captain Harlock animated show so I can't tell you how accurate to the original ship it was, but it looks just like I would have imagined it except way more detailed. And I loved the plumes of smoke that billow out from the ship making it look even more menacing. I think the music and sound effects also played a big role in setting the atmosphere, and it comes through great in 5.1 surround in both the Japanese and English versions. There is no sound in space, but sound is definitely useful making the ship seem like it's a haunted ghost ship capable taking on anyone or anything that stands in its way. And what would a ship be without its captain, who also looks amazing. The texture of his black leather outfit and the smooth motion of his cape and hair all just look so badass. What I didn't like so much about this movie is that it didn't make a whole lot of sense to me, even after watching it twice. It starts with some non-narrated text on the screen explaining how humans had traveled out into the galaxy and then got all depressed or something and decided to come back to Earth, but too many people came back and the Earth wouldn't have been able to handle them all so there was a huge war called the Homecoming War. Then a coalition was formed to end the war and they did so by building some super powerful battleship to prevent anyone from coming to Earth, and so from then on Earth was just to be looked at. That seemed like a pretty weak premise, but I went with it anyway. Then before too long we learn that Captian Harlock is obtaining these giant bomb-like things called dimensional oscillators so that he can place them in specific areas of the galaxy and then detonate to apparently reset history. At this point I'm like WTF?! And it still gets even more confusing after that but I don't want to give too many plot points away. I'll just say that I really didn't understand what was going on towards the end. It was a really great looking and sounding movie, but I really didn't care for the story. I really wished there was and extra feature on the disc which would help explain it, but I'm afraid this release is bare of all extras. All we get is the 111 minute moview. 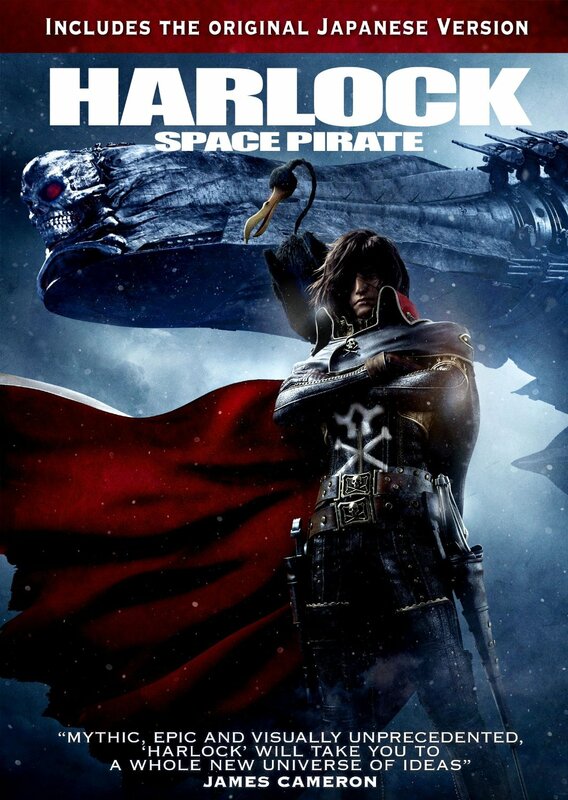 A mysterious space pirate of the future, Captain Harlock, is determined to return his death ship and loyal crew to a battered Earth, which has been declared off-limits by the intergalactic Gaia Coalition. The rogue captain comes up with an incredible plan to go back in time to rescue Earth, but that includes the destruction of everything, as it exists. A young soldier of the Gaia Coalition volunteers to go undercover on the infamous skull ship and assassinate Harlock, but he soon discovers things are not as they seem. As dark secrets of the past are uncovered, the fate of the entire universe teeters on a very thin edge.